Ask power pop fans to name some of their all-time favorite albums, and one or more of Big Star's three classic 1970s LPs, #1 Record, Radio City and Third/Sister Lovers, will more than likely be at the top of the list. For good reason, too - all three are packed with stunning and timeless songwriting (if there's a power pop song that surpasses "September Gurls," I have yet to hear it). Not only does Big Star stand out among their '70s peers by having paired some pretty dark, heavy themes with meticulously crafted pop-rock music, they have a storied history to match. It's a history marked by depression, untimely death and the struggle to be heard - in fact, it wasn't until long after the band's original tenure that their music received significant recognition. To add to this troubling history, two founding members - Alex Chilton and Andy Hummel - died within a few months of one another earlier this year. Still, the fantastic tunes live on, and a group of Chicago musicians will show how much the band means to so many people by paying tribute to them on Wednesday, December 15 at Schubas. "You Get What You Deserve: A Tribute to Big Star" will feature Steve Frisbie (of Frisbie), Tom Szidon (of The Joy Poppers), Mike Zelenko (of The Ladies & Gentlemen, and who also played drums in another excellent-yet-ill-fated power pop band, Material Issue) and John San Juan. 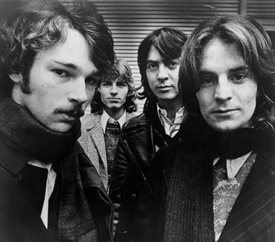 The group will celebrate Big Star's legacy by taking on some of the band's greatest songs. As a bonus, Village - one of the finest bands Chicago has to offer currently - will open the night. No power pop fan in Chicago will want to miss it. 8 p.m., 21 and over. Tickets cost $8 and are available here.